Do you and your kids drink enough water to stay hydrated through out the day? We've started making lemon ginger ice cubes to flavor our water, increase health benefits, and remind us to drink up! If I had to prep my lemons fresh for every glass of water I know I would just skip it. Having a stash of refreshing ice cubes on hand to add to our water glasses all week makes healthy refreshment a breeze! First, a confession: I usually refuse lemon in my water at restaurants. I've read about the germs that may or may not be on restaurant lemons so I'd just rather pass. 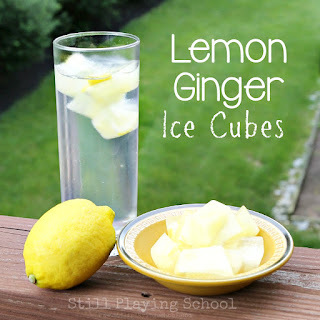 At home, though, our BFF neighbor recently got me hooked on a lemon ginger infused ice cube idea that our preschooler E has been enjoying this summer as well! 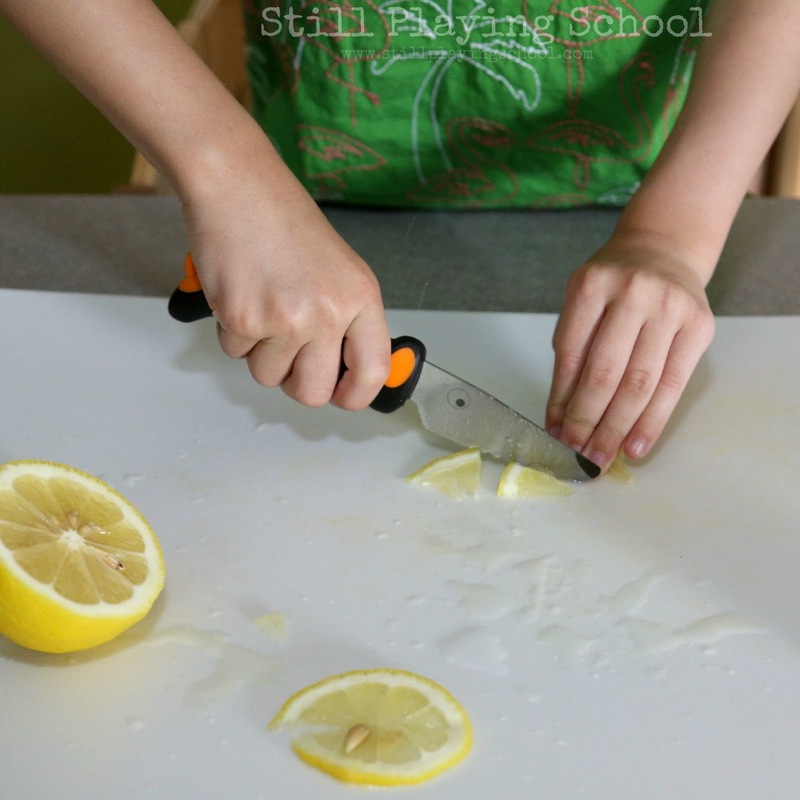 At home, we begin by washing the lemons and our hands well then slicing the fruit. 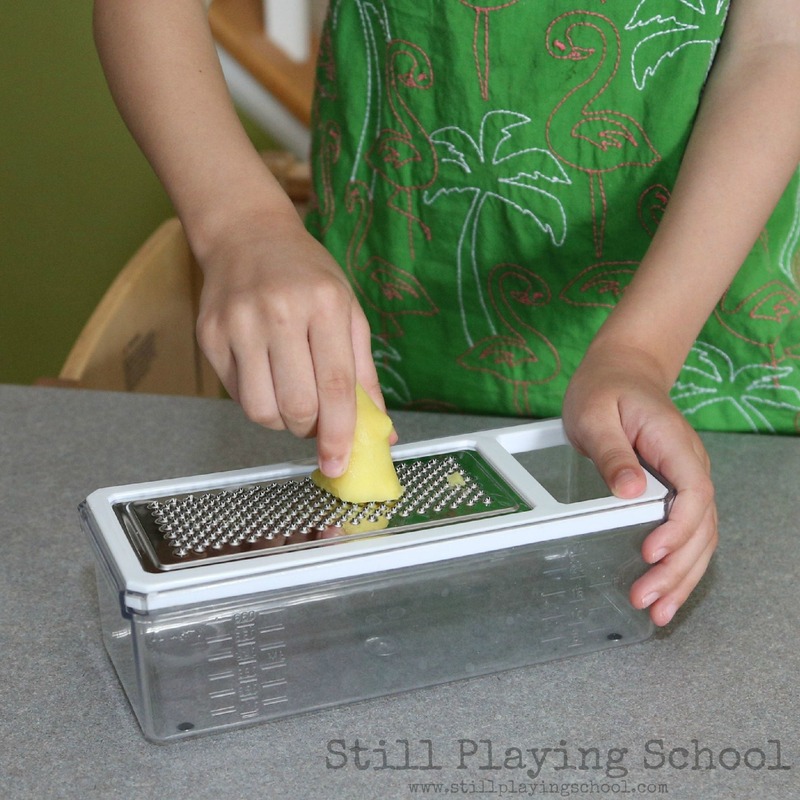 E is using our favorite child safe knife to cut little lemon wedges that will fit in our ice cube tray. She is practicing fine motor skills and one to one math concepts as she divides the fruit among the tray. 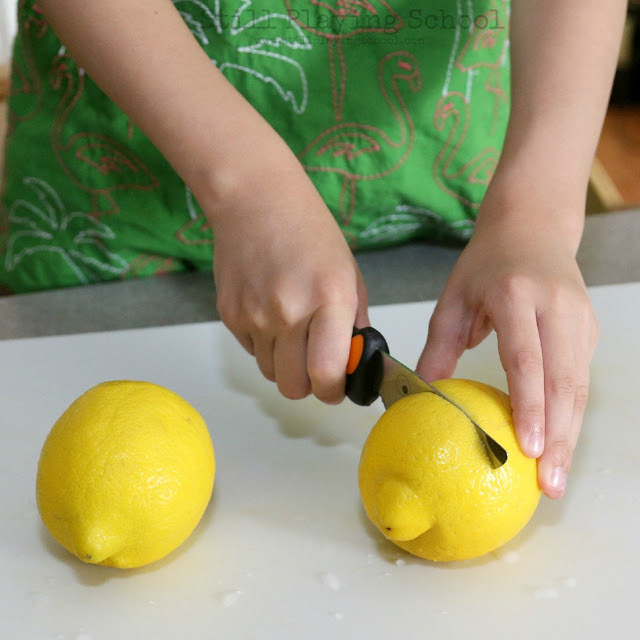 We squeeze the remaining lemon juice with our citrus juicer. We used two large lemons for a tray of twelve ice cubes. 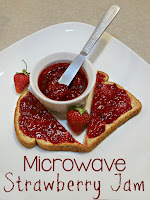 You can use more or less depending on what you have on hand at home! 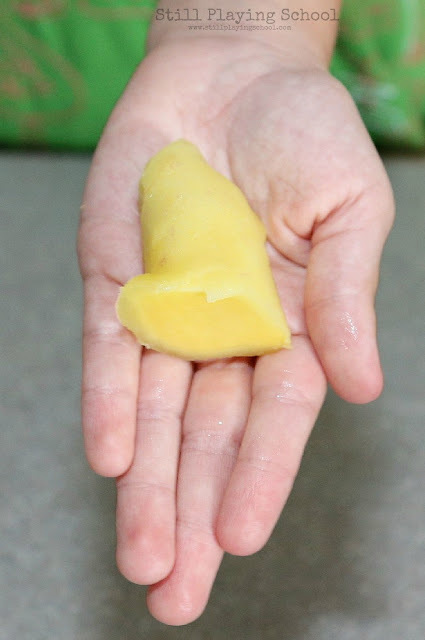 I peeled a piece of fresh ginger with a dull spoon. We keep our ginger fresh by freezing it. 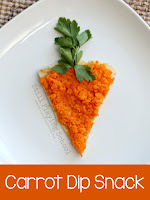 The frozen ginger is so simple to peel and grate! Again, the amount of ginger you use is up to you. We used this whole piece. 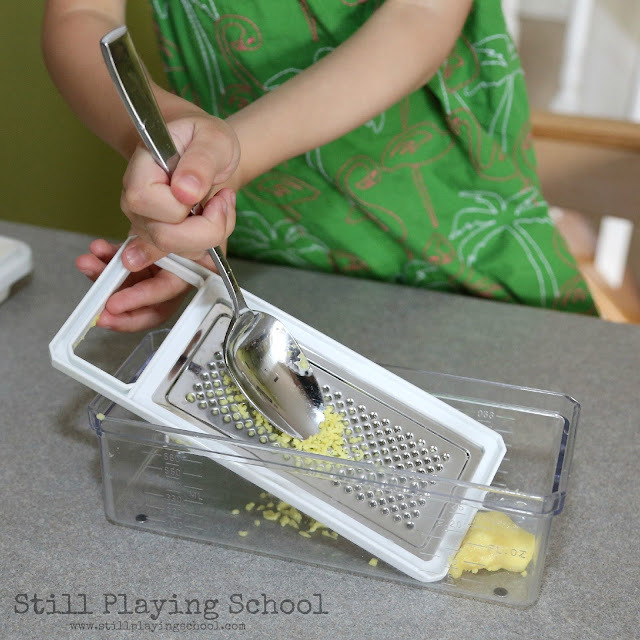 E used the microplane blade on our grater set. 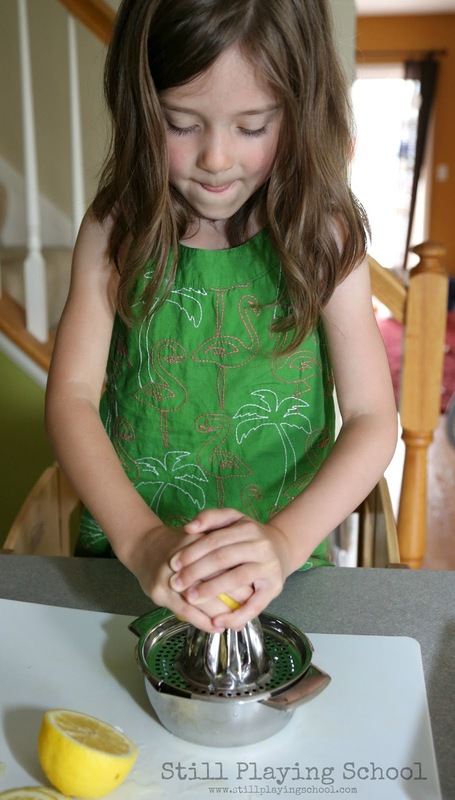 The ginger becomes a fine paste which we then spoon into each ice cube tray section. You can skip the ginger if you aren't a fan of the taste. We love ginger and the health benefits are fantastic! 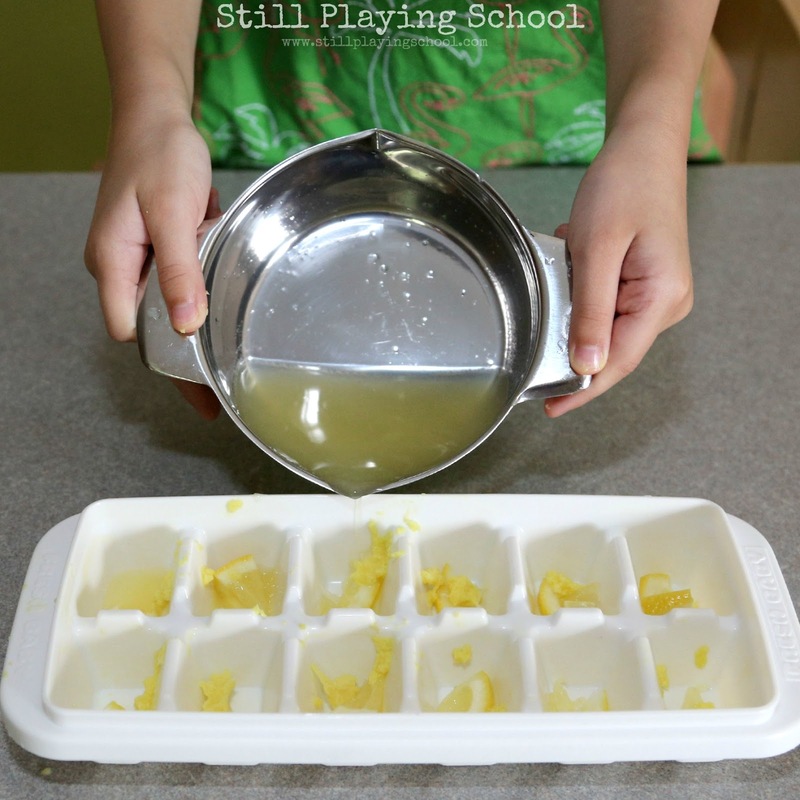 The lemon wedges and ginger paste is divided evenly in the ice cube tray. 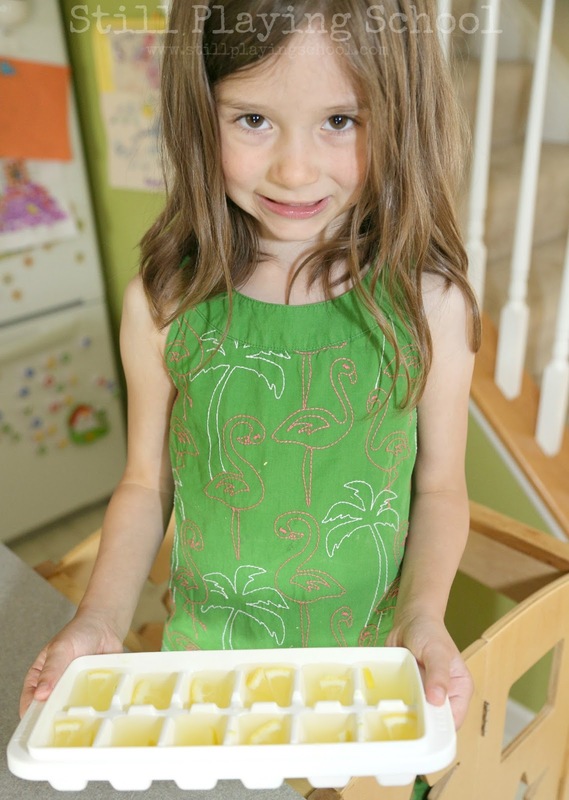 We add the lemon juice to the tray and then fill the same container with water to finish the cubes. This rinses every last bit of lemon goodness into our ice cubes! Yum! 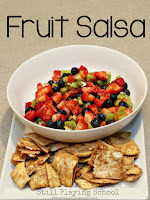 Freeze the cubes and enjoy! A tray of twelve cubes will last us most of a week. I put two or three cubes in my water glass in the morning and refill with fresh water all day. Sometimes I add fresh lemon balm or mint from our herb garden. 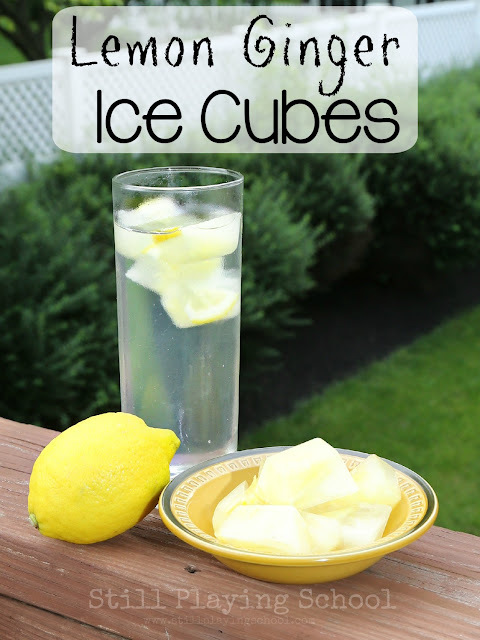 These ice cubes would also be delicious in iced tea or lemonade! The possibilities are endless for any taste! How much water do you drink per day? Would this idea increase your water intake? Just printed it out and about to add more Lemons to our order fingers crossed we can get our kids drinking more water.